What Is The Difference Between Statics, Dynamics, Kinematics, And Kinetics? Statics: It is the branch of mechanics which deals with the analysis of loads and their effect on a system when its acceleration is zero or it is static equilibrium with the environment (relative motion is zero). The system may be in stationary or it is center of mass moves at constant velocity. However, term statics usually represent the analysis of loads on the stationary rigid body. The load on the system are force, torque or momentum. Dynamics: Study of bodies when it is in motion. 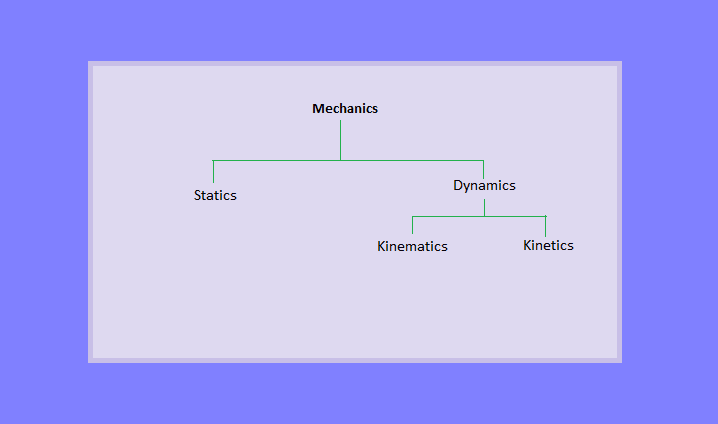 It is further divided into Kinematics and kinetics. Kinematics: It is the branch of mechanics which deals with the study of relative motion between the various components of system or machine. Kinematics describe the motion of an object without considering the forces that cause the motion. Kinematics interested in pure motion only, the system is considered as point body. It is used to learn about the properties such as displacement, velocity, acceleration and their variation with time. For example, study of the motion of transmission pulley, gears etc. Kinetics: The branch of mechanics which concerned about the relationship between the motion of the system and the cause (forces& torque acting on them) of the motion.